Hi all! 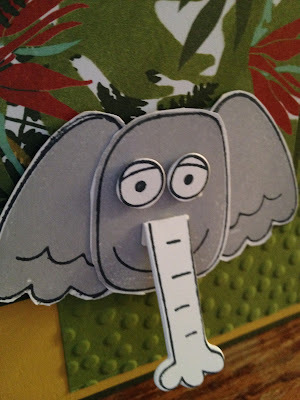 I had a card to share with you today but can't find it now! The next pictures will explain why, and why I'm not stamping as much!! This corner housed a table where I kept my DSP, my works-in-progress, and my embossing station I hope to buy a melamine countertop and some base cabinets or drawers here eventually.. This corner had cabinets "way back when" before I moved a desk there. There was a bar sink that never worked too. Cabinets up and down with a new sink will be here when we're done. I can't show you the rest of the room because it's in shambles! Everything that had a home (or a pile), has now moved into the center of the room so they could plaster and paint. I was smart enough to move some things, but many things won't be found until the end of the project when I give them another home. Class was quite humorous Tuesday night -- I'd go down to find an item, emerge 15 minutes later. Then again, 5 minutes later ... repeat the process!! This probably won't be my dream craft room. It's supposed to be a family room. My husband kind of wants it back. My thought was that if I have cabinets, it's a bit more organized, can eventually be a wet bar if we sell the house, and I still have a craft space. The reason for the remodel now is the damage that was done last year with the humongous icicles and the ice dam damage that ensued. The insurance company wants to see progress to give us a check! So ... in the meantime, I'll do my best with what I can find. In the end, I hope it's worth it! I looked at cabinets today (my husband approved the choice, but we haven't ordered yet), brought home carpet samples, approved a paint sample, and the work will go on!! This was the title of last night's card class: although it was called Birthday Blooms, only one card actually used that set. However, all of the cards were made to be birthday cards and were floral! 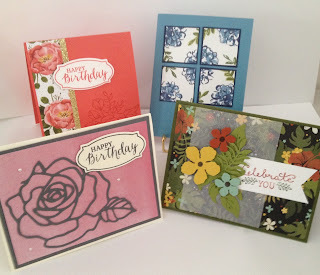 I did give the option of other sentiments -- the Rose Wonder stamp set has some beautiful sentiments perfect for birthday, sympathy, thank you, etc. Three of the 4 cards were swap cards that I received recently! Love them! I think all of the cards pictured here were remakes of the swap cards: the Watermelon Wonder card was a sympathy card, as was the front pink card (uses the new Sale-a-bration paper!). The back Marina Mist card was a thank you card -- I loved it and remade it to say "Happy Birthday" in Night of Navy ink at the bottom (sorry it's MIA in the photo!). Do you recognize the front card on the right? It's right out of the Sale-a-bration catalog, but I changed out the sentiment on this one too (it's a thank you sentiment in the SAB catalog) I just love this card! 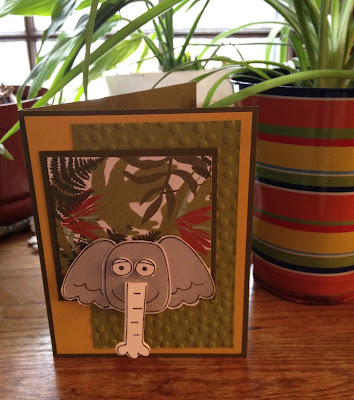 It features the Botanical Gardens bundle -- framelits, stamp set AND paper!! Do you LOVE the new catalog?! Do you HAVE the new catalog?! You can link to it on my blog, or contact me if you'd like me to send you one!! Have a wonderful day!! *The list of supplies below showcases the stamp sets and designer papers plus framelits I used for the cards above. If you have a question about specific colors, leave me a comment. I'll be happy to supply that to you too! In the Jungle with ... Dumbo?! Last night I went to my upline, Marilyn's house for our annual Holiday Party. It ended up being more serious than a party, but was still lovely to get together with friends and fellow demonstrators -- with hardships hitting each of our families this fall, the time together was very precious. Isn't he so cute? I named him Dumbo, but he doesn't look like a Dumbo to me! What would you name him? The stamp set has 49 pieces, so you can do just about anything with him! I love his 3D trunk! !